We get our fair share of gaming mousepads here with various qualities to them and a sense of what they can do for your game, but we don’t really get a ton of them that light up along with your keyboard and mouse. Enter Razer’s Goliathus Chroma, their latest soft gaming mouse pad. But is this a useful mat or just a shiny object? We gave it a test run to see how it handled as we played. The mat itself is a 10″x 14″ surface with a soft micro-textured cloth surface like you might find in most mousepads. The bottom is a textured no-slip rubber base that tends to stay in place when you put it down. Essentially, they have the basics covered when it comes to just making a mat, and when we played games on it there wasn’t anything bad about it. I want to get that out of the way first because that’s what you normally review on a pad or mat and there’s not much to say other than it works well. The parts that need focusing on are the light and the usefulness of the mat. 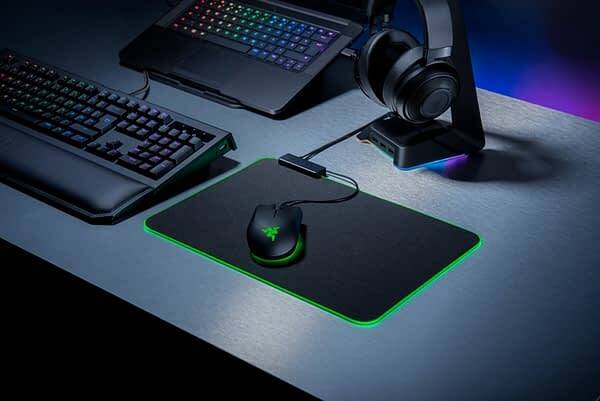 The mat comes with a Razer Chroma light tube that goes all around the edges of the mat to create the lighting effect when you plug it in. The mat uses a standard 3.0 USB connector, but it can be plugged into most any USB port for the effect. The lighting will run in a rotating rainbow on it’s own, but you can adjust the color using the Razer Synapse software that you might already have if you’re using it to program the colors in your mouse and keyboard. The top of the mat where the power comes in has a mouse cable catch, but that’s about all there is to it. 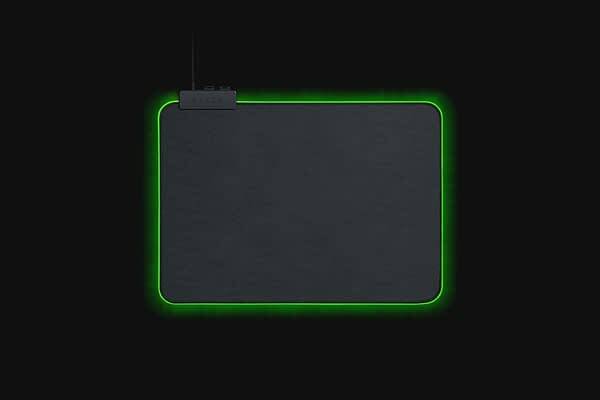 Now to be clear, we actually like the Razer Goliathus Chroma Mouse Mat, but we’re going to be honest with you, this is a mouse mat for Razer users. Having a light glow around the pad in the dark is nice and flashy, but it serves little purpose as most of my time is focused looking at the monitor. The entire purpose of buying one is to link it to your existing products and make it do the same light show as the others. That’s it. That’s no extra qualities to it beyond the utility uses as a mouse mat. The mat itself is $40, which we will say seems reasonable for the tech involved and the notoriety about it when people see it. 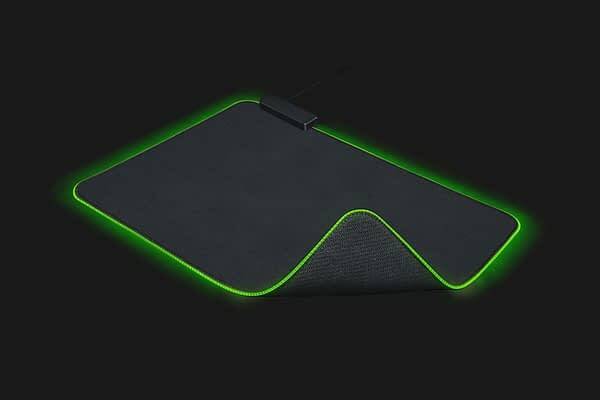 It’s a cool and useful mat, but it’s more for Razer lovers who need everything to match.